Congenital heart defects (CHD) are among the most common group of abnormalities found at birth, affecting nearly 1 in every 100 infants. While many affected infants have less severe CHD, more severe CHD is still one of the leading causes of death among infants. Infants with CHD often have otherwise healthy families with no history of CHD and have been delivered after an uncomplicated pregnancy. More than 90% of major forms of CHD can be identified before birth by fetal ultrasound in experienced hands. Detection of CHD is usually the result of careful attention to the heart of the fetus during a routine ultrasound screen, typically performed between 17 and 22 weeks, as provided in our practice. Some pregnant mothers are at increased risk of having a baby with CHD, including mothers with diabetes and other less common health conditions, where there is a family history of CHD, increased nuchal translucency(NT) and with certain medication exposures. 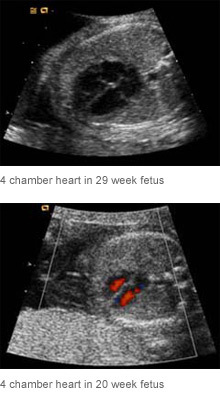 These pregnant women should have a more detailed assessment of the heart of the fetus by fetal echocardiography, in which the entire assessment is focused on the fetal heart structure, function and rhythm of the heart. Prenatal diagnosis of significant CHD provides an opportunity for the care-givers to plan management of the fetus and pregnancy before and after birth. In doing so it has been shown that prenatal diagnosis results in improved survival and condition of affected infants. Infants who present with severe CHD only after birth many times are extremely ill by the time the diagnosis is made. When a diagnosis is made early in the pregnancy, prenatal diagnosis also provides an opportunity for the pregnant mother and her partner to learn about the condition and what it means for the fetus and their family before and after birth, to undergo additional tests to look for other problems in the fetus, and to make choices regarding the pregnancy that is best for that family. Formal Fetal Echocardiography can be arranged with Dr. Anita Grady from UCSF or Dr. Norman Silverman by calling our office at 650-343-1655.